On Facebook and on blogs, and in coffee shops, and just about everywhere people are, folks are telling where they were on 9/11/01. Me - I was cleaning up the breakfast dishes. I turned on the little TV in the kitchen and Charlie Gibson on GOOD MORNING AMERICA was telling us about the horrible accident at the World Trade Center. Almost as soon as I heard him say that, he said that another plane flew into one of the towers. So it was no accident... and our world changed. We were having a studio built over our garage at that time, so we had the workers come in our breakfast nook to watch the news reports that morning. It's amazing how close we felt to each other. Later that day I was in an elevator with strangers. Typically nobody talks to each other on an elevator. Well, pretty soon someone said, "Can you all believe what happened?"... and we all began talking to each other. I rarely post comments, but this one really commands my attention. I was Music Pastor at our church at the time. It really was one of the strangest moments of my life. That morning I was hard at work learning a featured song we were going to be presenting the following Sunday. I think the song was was illustrating a point in the message's topic of "time management" or something like that. I had been up early and was taking a break to check email, etc. when I read the story on the internet. One tower had just been hit and no one knew quite what was going on. My first reaction was, "This can't be real...this is some kind of gag..some kind of publicity stunt.." but then I watched as the second plane hit the other tower, and the horror of the insidious nature of this being planned was undeniable. Then it got worse as I saw the towers collapse knowing all the rescue people who died in that instant, having knowingly and unselfishly run into harm's way. Some break, huh? Feeling helpless I thought I should at least get back to learning my song, and wondered if this crisis would change our plans for the service. Then I realized the song we had already planned to do was perfect for this unexpected situation..."New York Minute" by Don Henley. Originally we had planned to do the song for another reason, but as the meaning of the lyrics washed over me, I realized that perhaps God had allowed us to be prepared in advance for all the people in our church who would be in shock and mourning. "In a New York Minute, everything can change..in a New York minute things can get pretty strange.....and in these days when darkness falls early and people rush home to the ones they love..you'd better take a fool's advice and take care of your own, cause one day they're here, the next day they're gone". That was great, Barris. And OH MY, I so remember us doing "New York Minute" that Sunday - and how it was planned. I remember that well Barris! Yes Carisa, and your muted trumpet was the icing on the cake in that song. It always reminded me of someone's soul crying out in such pain that words do not exist....like how the Bible says the Holy Spirit offers up groanings on our behalf..
Wow, Barris. That must have been a powerful moment. i can remember where I was that morning. Ironically, i was doing a service call at an aircraft insurance company in Belair, MD. The business was in a home, and they had the TV on. I stayed there awhile watching the second plane hit...and the towers falling. I can't remember much of the rest of that workday...only that it was heartbreaking. some months after, my husband's mother and aunt came up from Texas to visit. My husband decided we would all take a day trip to NYC. We drove in to the city and he just drove around. We started heading to the southern end of Manhatten, and all of a sudden we realized we were at ground zero...or at least as close as we could get. I was instantly overcome with emotion. The enormity of the loss was still so very evident...pictures were still on fences around the site...there was a distinct odor...and it was just so still. I will never forget that moment. 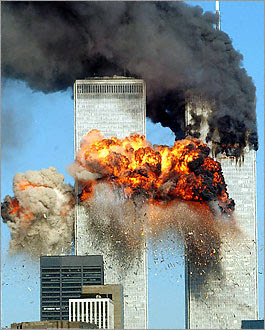 I felt like I was in a bad dream.When I saw the second plane hit the other tower,I knew it was a terrorist attack. I think the United States grew up that day. We knew then what the people of countries like Israel go through every day. 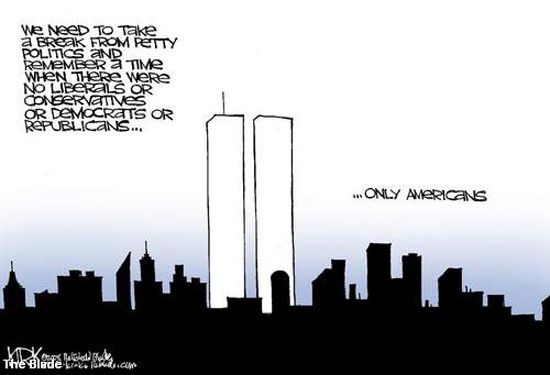 May we never forget the victims. God bless the USA. I remember the day very clearly. I cried all day and all week, and I'm not much of a crier. I had a friend in the army and I knew he would be going to war soon. I too was cleaning the kitchen after getting my family off to school and work and had the TV on the Today Show. Katie Couric 's facial expression registered first - a mixture of deep concern, confusion, fear. Then her words reached my brain. I called my husband and told him a plane had flown into the WTC and asked him how that could have happened. We commented on what a bad day it was going to be for those air traffic controllers, and of course expressed concern for the people in the building. We hung up and I continued watching and doing dishes and then I saw the second plane hit. I called my husband again and said, "Something is very wrong." My instincts were to gather my family. Go to the schools and bring my children home, get my husband home. I didn't do that though. Instead, I watched the coverage and stayed on the phone relaying info as it came in to my husband and his co-workers. I'm pretty sure those dirty dishes sat in the sink until after supper that night. I remember at some point in the afternoon going outside and walking around the backyard, touching a leaf here and there, smelling the roses, taking joy in our dogs running, and trying to figure out how to help my children(16, 14, and 12) interpret what they undoubtedly had been told and even seen at school. While the day of 9/11 stands out, what I remember most though, was the following Thursday at a band concert showcasing the high school band and the middle school bands that fed into the high school. for the first time in all my decades of band concerts, the colosseum was packed - standing room only. The middle school band played, and then the high school band played the Star Spangled Banner, America the Beautiful, and God Bless America. Again, for the first time, the voices of the people singing overshadowed the band. Every single person singing full voice, holding hands, arms wrapped around the shoulders of complete strangers, and yet not complete strangers because we were part of the greater family of American citizens. For me and I believe those who were in attendance, that is where the healing began. We had the beginnings of The NOAH Project (school for children with autism) at my home. We were working with three kiddos (one-on-one) and were training 10 adult child facilitators. I had seen the plane fly into the WTC in disbelief on my laptop and immediately went over and turned on the TV to watch more. I had asked those working with the kids to remain calm and carry on the best they could and made myself available (rather than going to work) for anybody who wanted to dialogue about it. I took over with the kids where others needed to make calls and check in with their families. One of our child facilitators-in-training could not stop crying and wanted to go get her children out of school and be with them. I asked her if she was okay to drive. When she answered yes, I said that was fine and told her to let me know how they were doing. Three days later she called and told me she QUIT...because they had been crying and holding each other for three days and nights and she didn't think we responded with enough sadness or fear. I wished her the best, what else could I do? We were all greatly effected, but I knew we had to go on. I remember speaking at length with my other son who was 9 at the time and in public school. He wanted to discuss what it meant, he told me he was confused (as we all were). He wanted to know if he was safe to go to school, he wanted to know if he should be away from us. I remember, there was a lot of sorting out to do and I remember praying for God to watch over us and protect us, all of us...our family, our friends, our entire nation. Quite often we cannot understand what God's big plan is and how He can allow such things. But, as we look back we can see that He has had his hand in our healing and in Romans 8:28 we are told "And we KNOW that all things work together for good to them that love God, to them who are the called according to His purpose." Even those we lost were going to a much greater eternity, if that is how they believed. I think what I walked away with is a knowing of our powerlessness (as individuals) and a reordering of priorities....the importance of love and expressing that love in the moment...ALWAYS! Audrey, that is amazing that that employee thought you didn't respond with enough sadness and fear. Good grief. Well, your comment was wonderful... I guess I need to not let that 'one bad apple spoil the whole bunch'. I was flying my private jet when the controller asked me if I was aware of what just happened in New York City. I was told a large aircraft had flown into a building. As I approached an airport to land I was told all departures were stopped. Some 4 days later I was allowed to leave. When I did I stood my jet on its tail and with three engines roaring at max power I leveled off at 12,000 feet. I went low altitude home. A controller commented he had never seen a jet flying that fast on radar. I just wanted to get home and hug my wife and my children. Her response was surprising. What I did not get was hysterical, which was her response and why I was worried about her driving home. One of the things we were teaching our child facilitators was to let go of judgements, so they would not stand in the way of each child's development. I am thinking we may have had more work to do there. It is a difficult lesson...one we spend our lifetimes mastering I suppose.